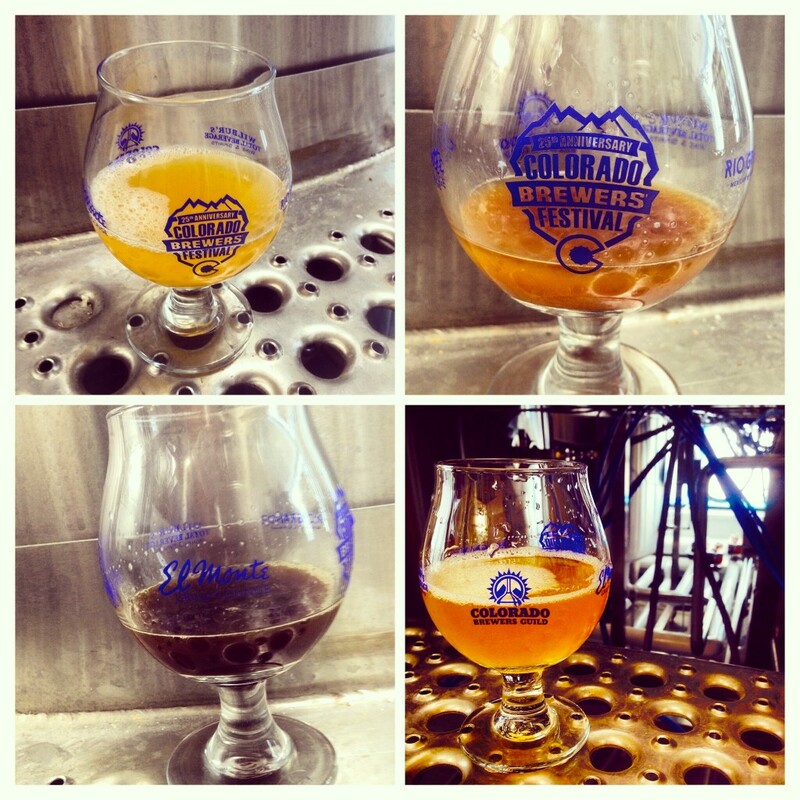 Last week I took the initiation into becoming a true Coloradoan. 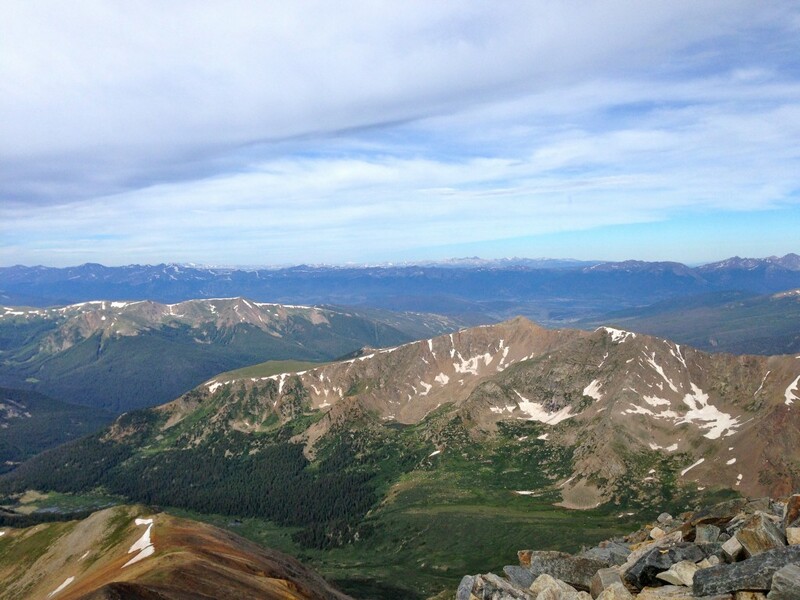 Topping a 14er – Gray’s Peak! (Spoiler alert – I summited). My bestie Michelle told me she was hiking Gray’s and Torrey’s and I figured that, since I have plenty of time on my hands lately, I should join. I drove down to her place last Sunday and we binged on sushi to fuel up for the ascent. Our alarms were set for 3:45am so we headed for bed around 10pm, me trying to ignore the gentle throbbing in my temples. We left the house at 4:15am and headed into the mountains to hit the base before 6am and avoid the afternoon thunderstorms. 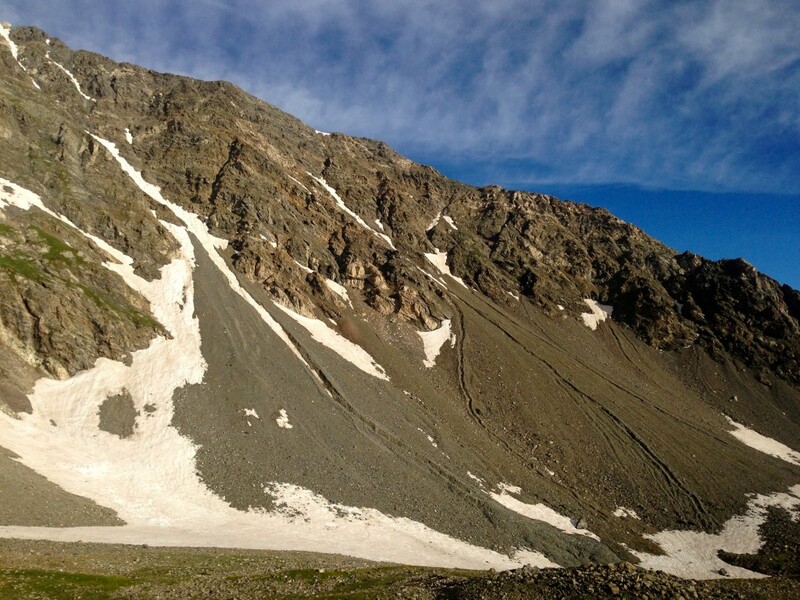 We drove up the windy, rocky road past the winter parking lot, heading for the summer lot at the start of the trail. The road got rougher as we got higher until our car took a nosedive into a deep trough. The tires spun and the aroma of burning rubber filled the car. I jumped out as Michelle reversed out of the trench, trying to see if there was a way around it. To the right, we’d ram into the rocks. To the left, the undercarriage of the car would be shredded. We reversed down, a line of cars slowly backing down behind us, before pulling a 3 point turn and parking in the middle lot. A handful of other lower clearance cars decided to join us after watching our little adventure and realizing they probably wouldn’t be able to get around the trench either. We pulled our packs on and started the 2 mile hike up to the start of the actual hike. The throbbing in my temples the night before was starting to knock a little louder. That hike up. Was. Painful. We finally reached the ditch we’d gotten stuck in when a large white pickup began to navigate through the same spot. An older gentleman got out to help guide the driver and asked if we wanted a ride. YES! 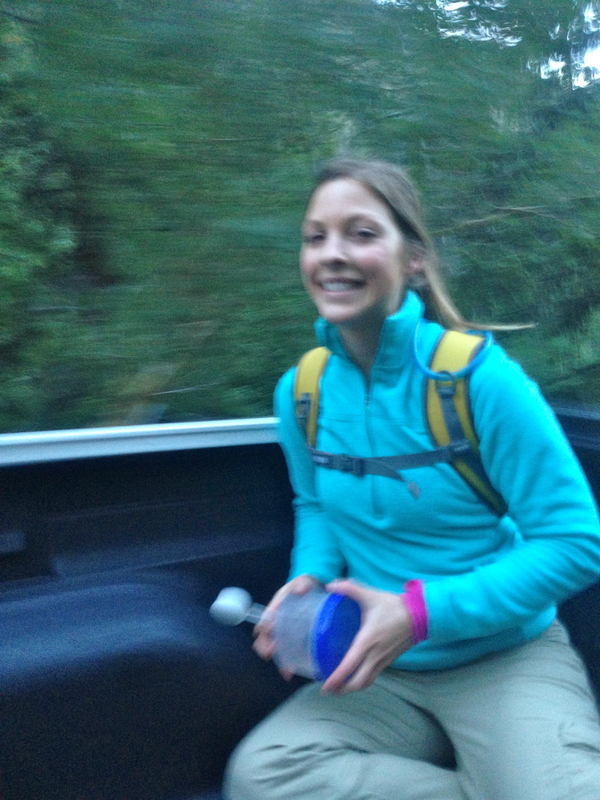 We gleefully jumped in the back of the truck and enjoyed the chilly, bumpy ride to the top parking lot, ready to start the 8.5 mile round trip. It was absolutely gorgeous! 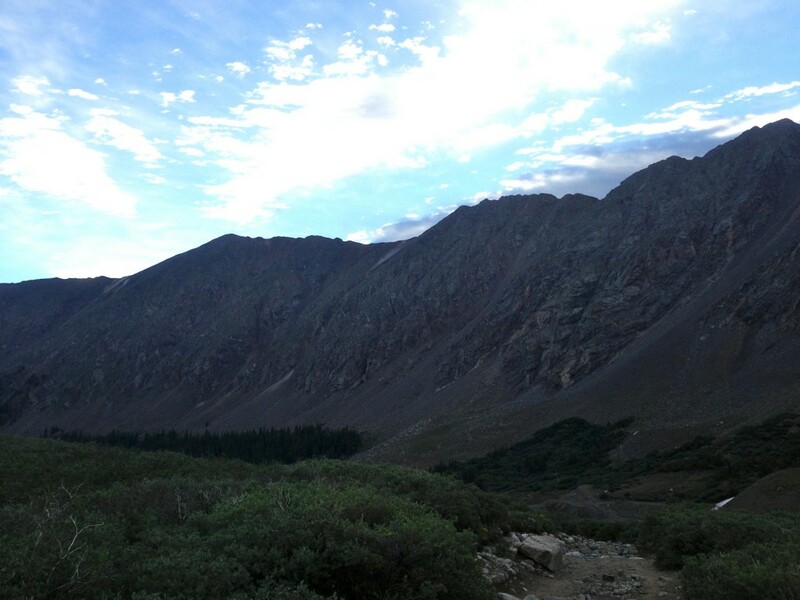 The sun started cresting over the horizon as the trail immediately became a steady incline. The first mile consisted of large, rocky steps before evolving into a crescendo of rocks that pointed directly upward. We huffed and puffed along, taking 30 second breaks to gasp for air before passing a handful of red-faced groups snacking on Cheez-Its on the side of the trail. It wasn’t a race, but man, we were so winning! As we continued on, we were passed by Superman. This guy was powering up behind us at inhuman speed. “Hiking for time?” I asked him. Turns out Superman (aka Patrick) just wanted some exercise and this was his normal speed for all of the many, many 14ers he’s topped. He ended up reaching the top of Gray’s in an hour and a half! The top! The glorious top! It took us 2 hours and 15 minutes to get from the start of the trail to the summit. My head was pounding full force now and the winds were whipping like crazy. 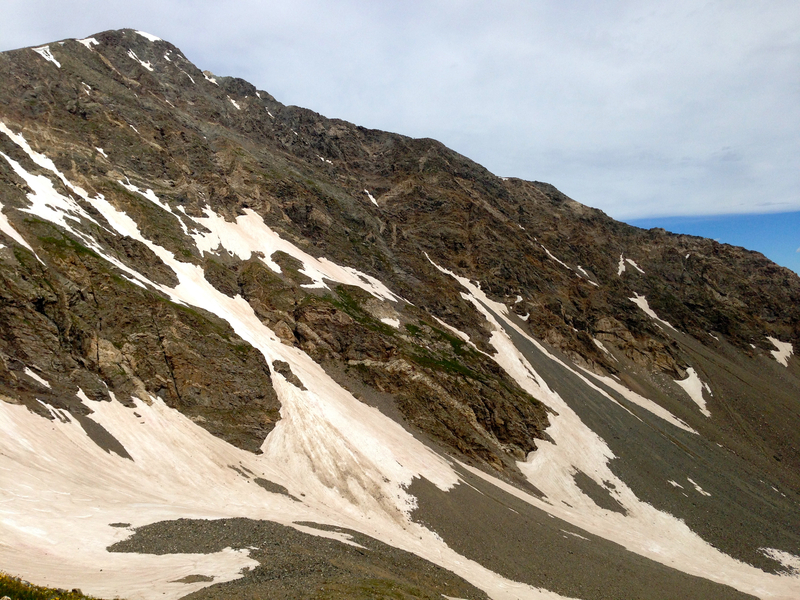 We pulled on our gloves and headed down the steep saddle across to Torrey’s Peak. 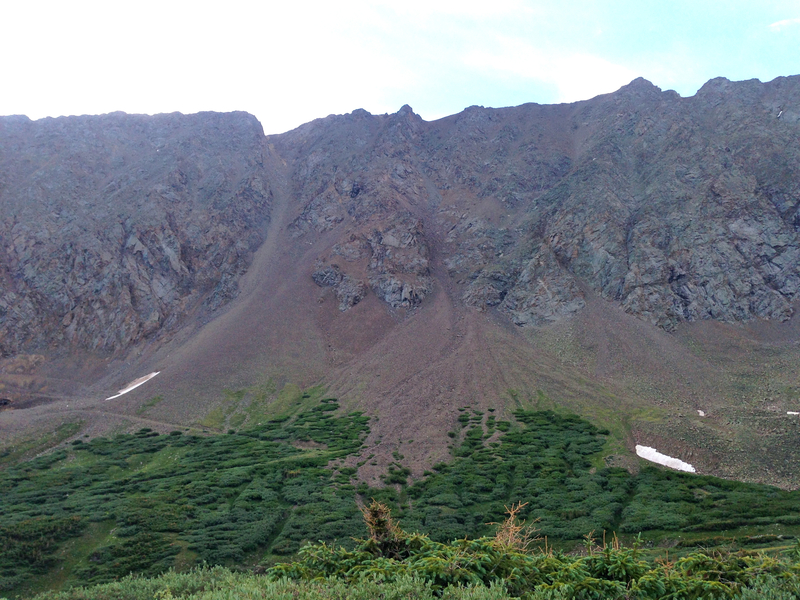 We dropped down at least 1,000 feet before starting an even steeper ascent. An hour later, we were standing on the top of Torrey’s, gazing in awe at the views all around us, scarfing down sammiches and chugging water. I debated going in to my pack to grab the ibuprofen for my head, but we were ready to start the descent and avoid the clouds that were rolling in in the distance. After a few more obligatory pictures, we started down. Superman joined us. He told us that while he was a powerhouse on the uphill, he preferred to take his time down to avoid injury. 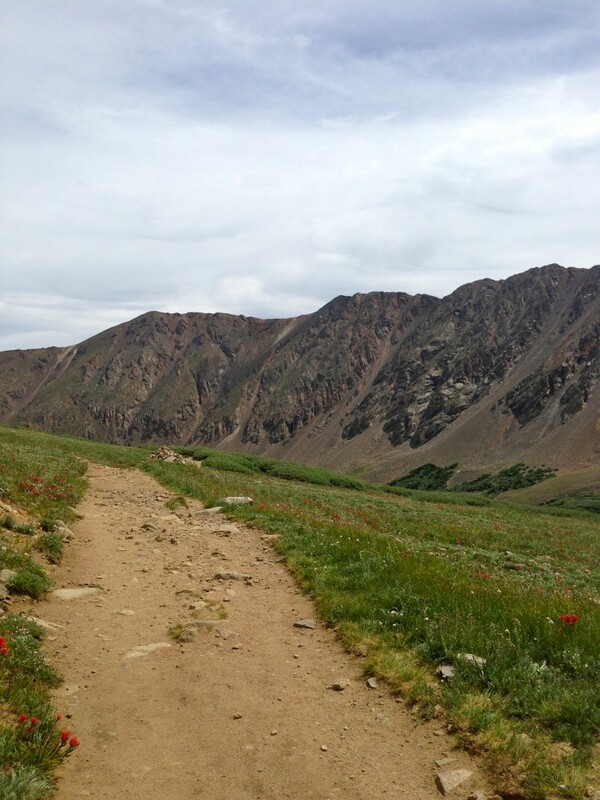 With the blisters forming across my feet, my aching knees and bruised soles, I decided that was a good way to go. The ground finally started to even out, but each step still sent knives of pain through my knees, feet and skull. Patrick (Superman) told us he was going to stretch his legs out and speed up a little and took off towards the base as we gimped along. As we continued, the memory of our lucky pickup ride up to the base jumped into our minds. And then we remembered that we would have to hike the extra two miles back down to the car. Lovely. We finally reached the base of the trail or, for us, the beginning of our final two miles. We hit the outhouse and started to cross the parking lot before we saw… SUPERMAN!!!! Patrick had waited for us after hearing our tale of the exciting drive up and gave us a lift down the mountain to where our car was parked. Patrick. Superman. Angel. We thanked Patrick profusely, took off our packs and chucked them in the back seat, took off our heavy shoes and peeled off our socks. 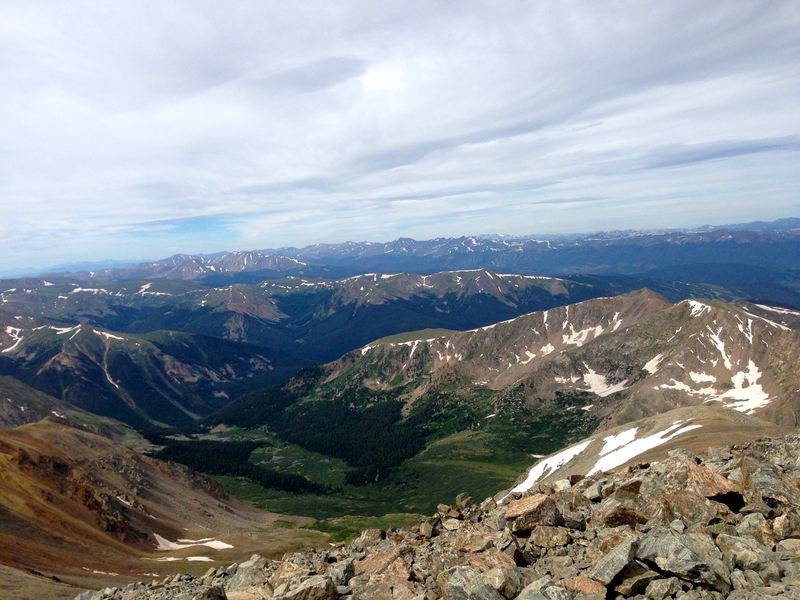 I’d just summited TWO 14ers! I threw a handful of ibuprofen down my throat in an attempt to silence the pounding in my head and we drove home. Flash forward to a week later and the headache is FINALLY gone. 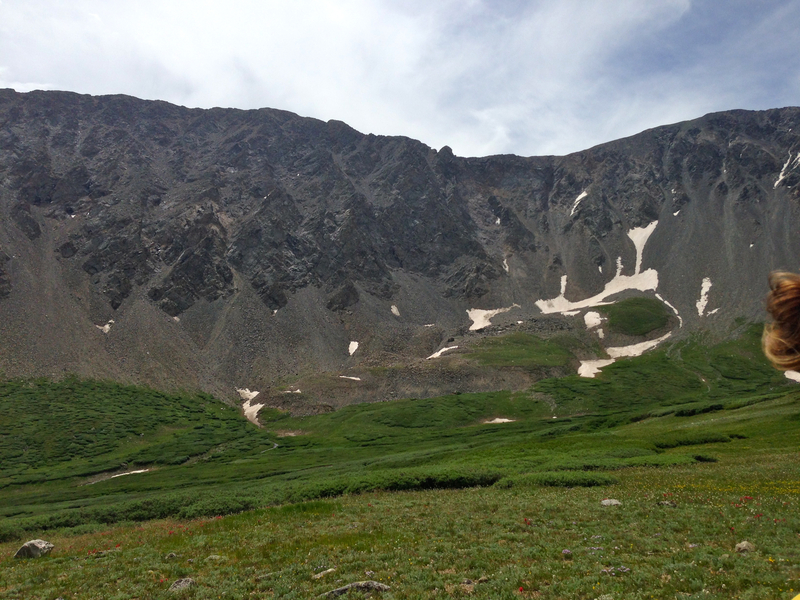 A solid week of aspirin, ibuprofen and gallons of water finally conquered the altitude headache. Quality control also seems to help a bit. A little extra vitamin B and protein to aid in the healing! 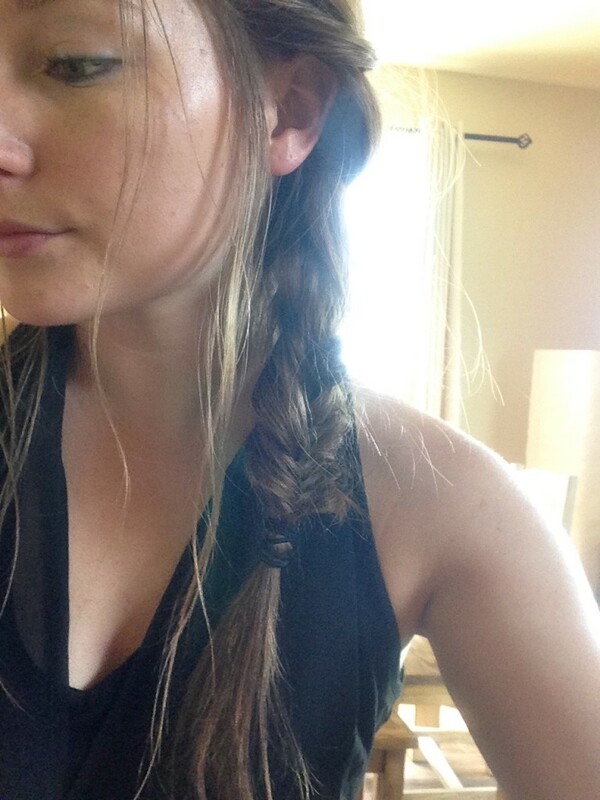 And braids. Just cuz feeling purdy also makes one feel better. 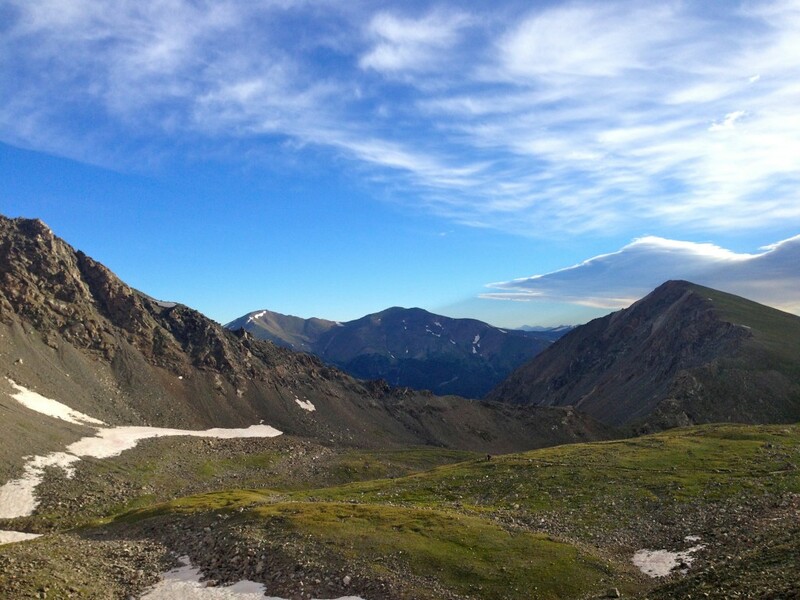 I’ve been a Colorado transplant since 2000 and have yet to do a 14er but planning to do my first in a few weeks! Great pics! WAY TO GO!!! 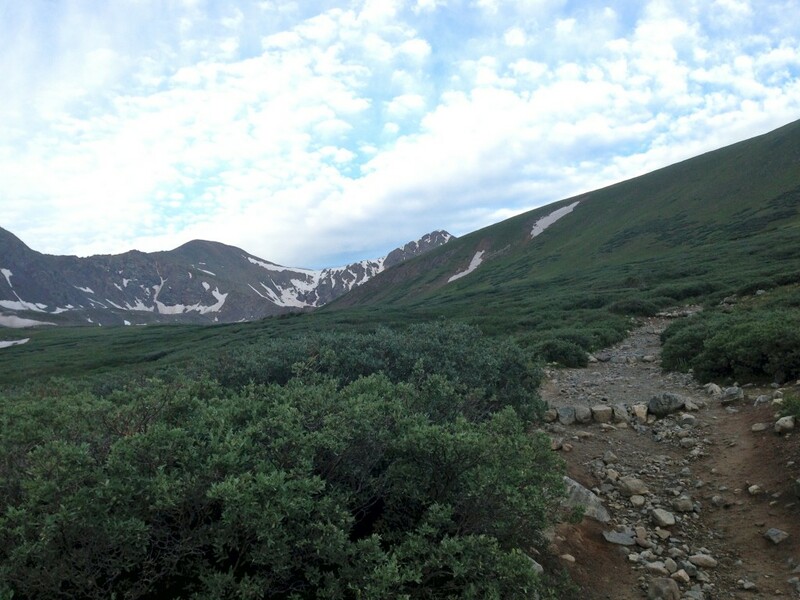 I just did my first 14er this weekend and also had lots of road difficulties 🙁 We should go together sometime to try another one though! Your road difficulties absolutely trumped mine. No fun. 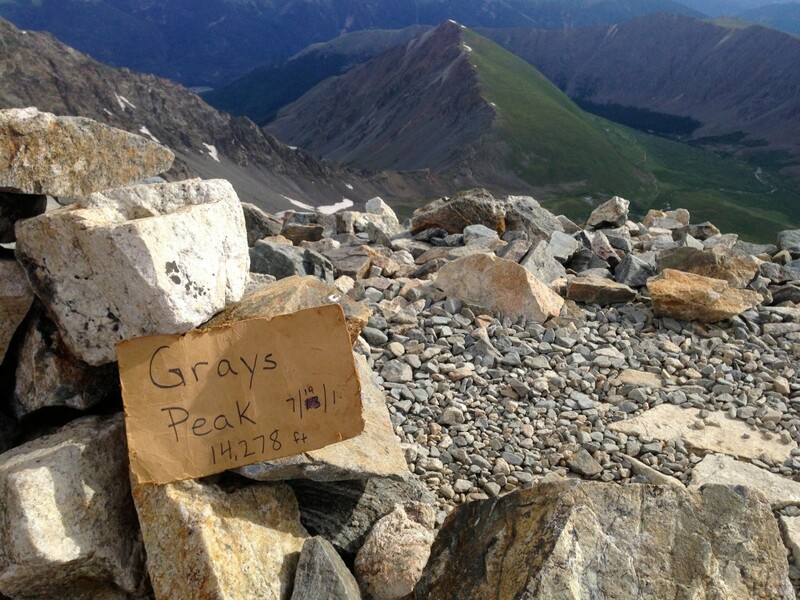 This is awesome- Grays and Torreys were my first 14ers too! I loved reading your re-cap and had to go back and read mine from two years ago right after. 😉 We also had to park super far away from the trail head and it took FOREVER to get there from the car (at least an hour). Luckily, we were able to hitch a ride back down. 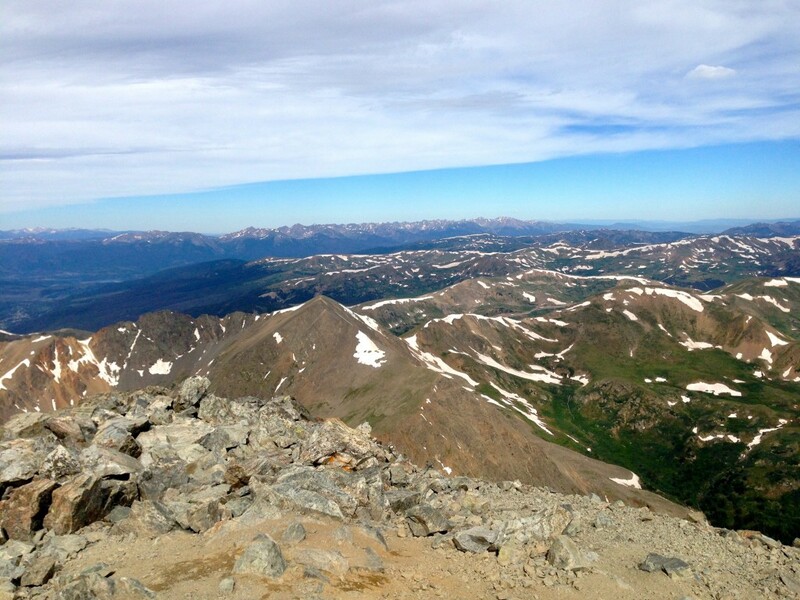 Congrats on knocking out two 14ers in the same day!! 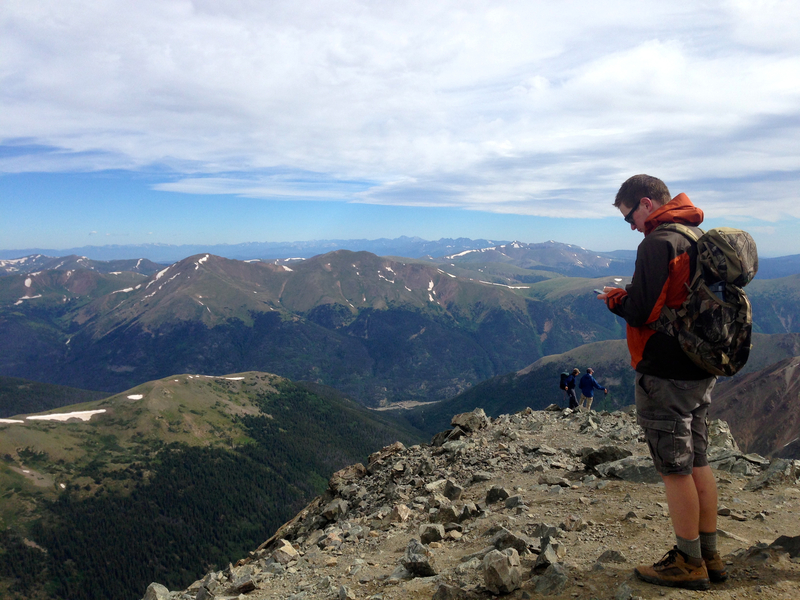 I definitely don’t think I’ll ever feel the need to do those 14ers ever again! 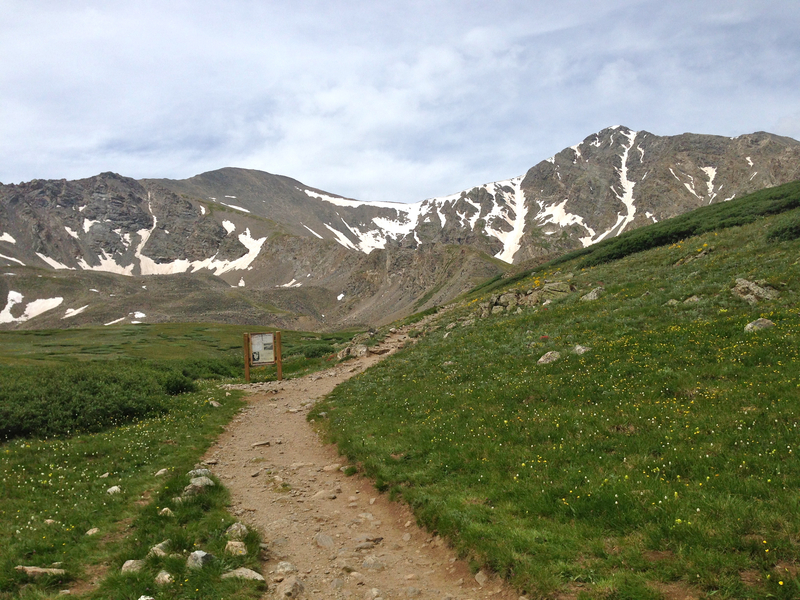 I’m thinking Bierstadt would be a good follow up to heal from the trauma.